I sought this pen out for its filling system rather than for its looks. Upon first seeing the pen I was struck by its simple elegance. This is a large pen, which really appeals to me. My first 823 was the Smoke colored 823. I bought it used. The transaction was a bit of a debacle as the seller sold the pen to me with an imperfect nib, and he did not disclose it at the time of sale (big no no). Thankfully, Mike Masuyama was able to fix it for me. So, I have to admit that that experience affected my first impression of the pen. My Amber 823 was purchased new. It came in a padded presentation box, and a bottle of Pilot Blue ink was included with the pen. The Amber translucent pen is really gorgeous. Pictures do not do the pen justice. Pens of this shape belong to a class of pens whose shape draws its inspiration from the first cigar-shaped pen, the Sheaffer’s Balance of the 1930s. This design has persisted for so long because it is not only pleasing to the eye, but it is comfortable in the hand. These pens come in three colors. Smoke, Amber, and Clear. All three are translucent. The Smoke and Clear 823s were imported into the US in very small numbers. They have since sold out. 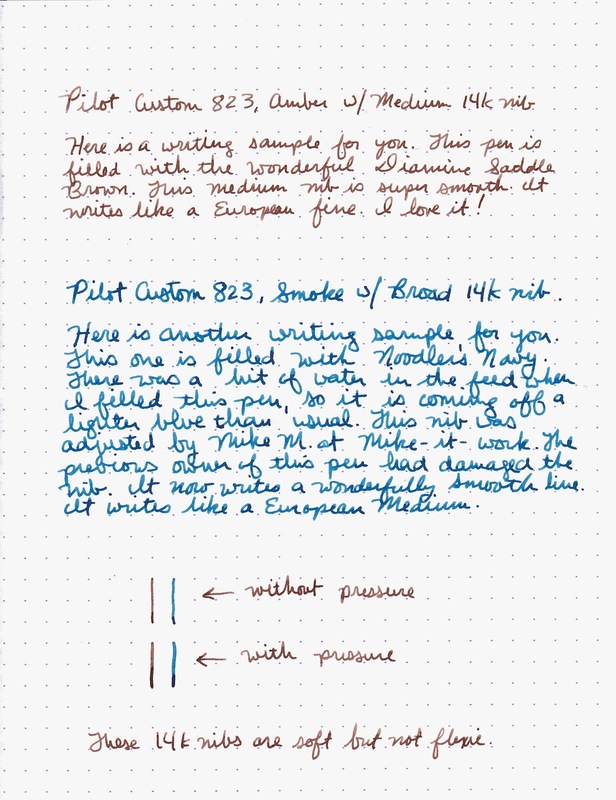 You can, however, get the Amber 823 at most Pilot retailers. If you want the Clear or the Smoke you have to order them from international dealers. 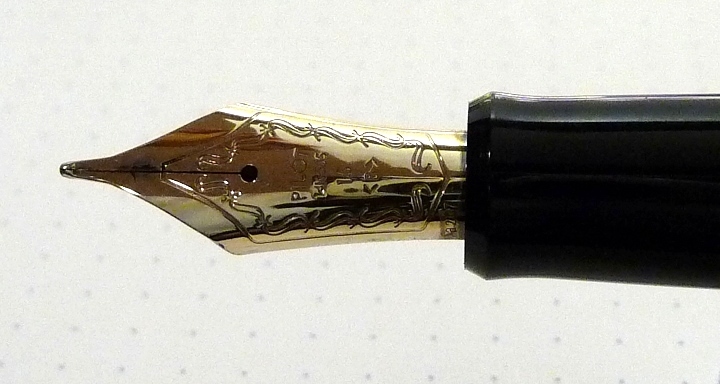 The nibs are 14k gold and the furniture is gold-plated. I usually hate gold plating, but it goes perfectly with the Amber resin. I just wish there had been a rhodium option for the smoke and clear versions. In terms of size, this pen can be compared to the Sailor Full Sized 1911, MB 146, Pelikan M800, and the Edison Herald. This is the size pen I prefer. Like the fountain pens of old, these pens are meant to be used as daily writers. Most of them were are not meant to be on display, and honestly, they aren’t meant for you to change inks constantly (although you certainly can if you want). This pen comes with Pilot’s largest nib, the #15 nib. It is made of 14k yellow gold. This nib is soft, but not flexie. Impacts to the page feel cushioned. This pen is only available in Fine, Medium, and Broad. Originally, I chose the Broad nib size. As I mentioned earlier, this nib was adjusted by Mike M. He did a wonderful job on this pen, it is now very smooth with a touch of tooth. It’s perfect for maintaining control of the pen without making the writing experience uncomfortable. The flow is quite consistent and juicy. My new Amber 823 came with a medium nib. It is a superb nib right out of the box. Just like its big brother, it is super smooth with a little feedback to help keep the nib under control. I’ve discovered, that I am very quickly becoming a huge fan of Pilot nibs. 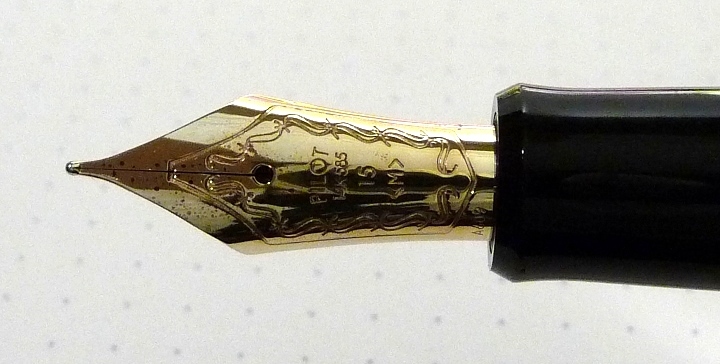 Really, it is hard to beat a Pilot nib especially one of their gold nibs. While the broad writes like a western medium, the medium nib writes more like a western fine. There is a considerable difference between the two. I love the broad nib most, but sometimes you just need something a little finer. The medium nib serves that purpose quite readily. I use these pens a lot and for very long writing sessions. They perform admirably. I’d definitely recommend a Pilot Custom 823 to folks who also do a lot of writing. This is a great pen with a great nib! For me, the plunger system is the reason I originally bought this pen. I love integral filling systems, and the plunger system has to be my favorite of them all. This mechanism is very smooth, and you can add some silicone grease to the barrel to ensure it stays that way. This filling system is simplistic and efficient. With the right technique, these pens can hold a lot of ink. As I mentioned in the video, one depression of the filler yields 1.5ml of ink, but if you use the two-step method, you will get 2.2ml of ink, and the pen will be filled to capacity. Now, a word about cleaning these pens. I have heard it said that these pens are difficult to clean. The plunger filler takes in and expels a lot of water to get the barrel clean, and the nib and feed pull out so that you can clean out any ink that gets trapped in there. It is also possible to unscrew the section, but I wouldn’t advise it. If you are too rough with it you can crack the barrel at the section threads. The grease used to lubricate the thread will stain with ink. You will not be able to clean it out unless you disassemble the pen (I would not advise this since you may crack the pen). This little bit of grease staining has only been an aesthetic concern for me. It has never interfered with my ability to use different inks in the pens. These pens can be quite expensive. The MSRP is about $360. If I’d had to pay full price, I probably would never have owned one. My pen budget very rarely extends that high. Each of these pens was under $200. If you can find one for around that price, then this pen represents a tremendous value for the money. You get a super smooth 14k nib, an exceptional plunger filler system, and a well-crafted high quality pen. Those qualities rarely meet for $200 or less these days (especially with the skyrocketing price of gold and the depreciation of the US Dollar). **Hint! Pam at Oscar Braun Pens is going out of business. She has the Amber 823 marked down to $199. Supplies are likely limited. ** Sorry guys. She is sold out! It’s not often that I buy two of any one pen. The fact that I have is a testament to how much I love these pens. The Pilot Custom 823 represents my perfect everyday writer. They are substantial pens with a girth of .5 inches or more, they have an integrated filling systems that work exceptionally well, they have gold nibs (my preference), and the nibs are smooth right out of the box. My smoke 823 has been inked with the same ink (Noodler’s Navy) for over a year now, and I use it just about everyday. The Amber 823 is new, but it is settling in as well. I fully expect it to be in permanent rotation just as soon as I find the right ink for it. 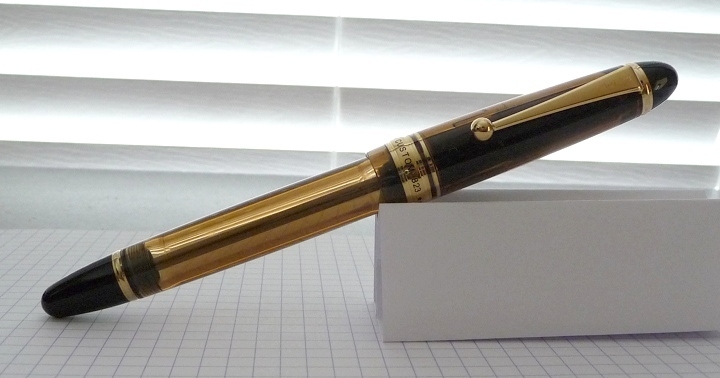 Wonderful review – this pen has been on my wish list for a while and will probably remain there. Unless I find a deal on one that I just can’t pass up. Trying to thin the herd at the moment, not add to it. Wanted you to know that a pal sent me his Custom 823 to try out. I used your video and got a full load of ink following your directions! First try ever. Thank you. I found a friend to swap out my 823 with a Medium nib for the PO nib which is VERY fine and finer than an EF. I got one on my Custom 74 but they are different sizes (#10 vs #15 on the 823), consequently the lines are a little different but still very smooth. I’ve owned one for 3+ years now and haven’t written with any of my other 20+ fountain pens since then. Completely agree, most awesome pen. Thanks for your nice and thorough review.